SSC has released today (17th August 2018) a latest document through its official website for request for proposal (RFP) of vendor change. Staff Selection Commission is usually discuss every details like whole procedure of RFP, Pre-Bid to Post-Bid methodlogy, Evaluation process and submission. 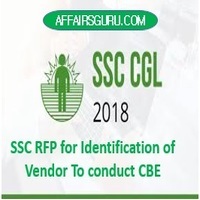 Information unveils that SSC has called for bid of selection of service provider (SP) who will conduct Computer Based Exam (CBE) for the candidates. Candidates apply the application form for various exams conducted by SSC. 2 What is Request For Proposal(RFP)? Dates for particular activities of the acquisition for Request for Proposal (RFP) has been provided. What is Request For Proposal(RFP)? It is a type of bidding request in which an organization or company announces that funding is available for a particular project or program and company can place bids for the project’s completion. Aspirants can check SSC Vendor change date finalization below in tabular form. Candidates can view or download the SSC RFP Document for CBE by clicking on below link.